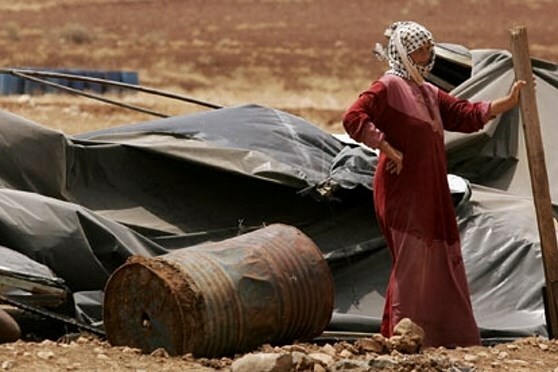 BETHLEHEM (Ma’an) — Israeli forces have notified residents of the Bedouin village of Khan al-Ahmar that they are at risk of imminent forcible transfer from their lands, weeks after Israeli Israeli Defense Minister Avigdor Lieberman reportedly announced that plans were underway to expel Khan al-Ahmar’s residents within a few months. Lieberman also said that plans for the full expulsion of the community of Susiya, located in the South Hebron Hills, were also underway. B’Tselem then reported that officials from the Israeli army and Civil Administration told locals in Khan al-Ahmar on Wednesday that their only option is to move to a so-called relocation site that was allocated by Israel to the Bedouin community without consulting them. According to the group, the proposed site known as al-Jabal West is located next to a garbage dump in Adu Dis. The Khan al-Ahmar community’s lawyer Shlomo Lecker had informed the Civil Administration officer in charge that he was not permitted to meet with his clients without his consent and presence, “yet the CA went ahead regardless,” B’Tselem said. A hearing at the Israeli Supreme Court has meanwhile been scheduled for Sep. 25, regarding petitions submitted against the Israeli state’s plans to demolish all Khan al-Ahmar’s structures, as well as a petitions submitted by illegal Israeli settlements in the area that want Khan al-Ahmar’s school to be demolished. “The Civil Administration’s actions appear to be paving the way for the state to claim that it is acting in good will and has consulted the community,” B’Tselem said. Earlier this year, Israeli authorities delivered demolition notices to every single home in the Bedouin village of Khan al-Ahmar, including the village’s elementary school. The village is located on the site of planned Israeli settlement development and on the Israeli side of the planned route of Israel’s separation barrier. According to B’Tselem, on Aug. 27, hundreds of Israeli settlers, joined by Israeli parliamentarians, demonstrated near Khan al-Ahmar, pressuring the government to move forward with its demolition plan. The demolition notices were issued on the basis of the community lacking almost impossible to obtain Israeli building permits, which the United Nations has said results from the discriminatory zoning and planning regimes implemented in Area C — the more than 60 percent of the occupied West Bank under full Israeli control. Khan al-Ahmar is one of 46 Palestinian Bedouin villages comprising of a population of 7,000 — 70 percent of whom are Palestinian refugees — in the central West Bank that are considered by the UN as being at risk of forcible transfer by Israeli authorities to alternative sites. “The Demolition of an entire community in the Occupied Territories is virtually unprecedented since 1967. Under the Fourth Geneva Convention, which Israel is obliged to respect in all its actions in the West Bank, this amounts to forcible transfer of protected persons, which constitutes a war crime,” B’Tselem emphasized.